The Revolutionary War is almost at an end, but all is not well within the ranks of the Continental Army. Rumors swirl throughout the camp that Congress may send its soldiers home without pay or pension once the peace treaty is signed. Facing destitution, many officers are prepared to march on Congress demanding pay. General Washington is forced to decide if he should arrest the conspirators for treason, convince the officers to remain patient, or pressure Congress to act. 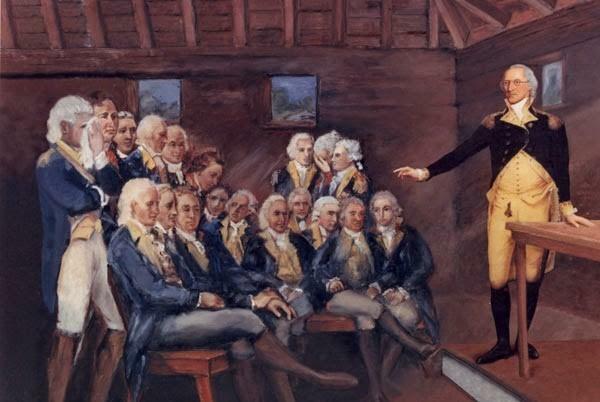 Should George Washington support his loyal troops or the fledgling government? The Newburgh Conspiracy was a plan by Continental Army officers to challenge the authority of the Confederation Congress. The officers were frustrated with Congress's long-standing inability to meet its financial obligations to the military. By early 1783, widespread unrest had created an atmosphere ripe for mutiny. In 1780, Congress passed a resolution providing half-pay for retired soldiers. However, as of 1783 the states had yet to comply with Congress’s request for the needed funds. As the British threat receded following the war’s last major engagement in 1781, the states became even more reluctant to fulfill Congress’s requisitions for the army. By late 1782, many in the northern army encamped at Newburgh feared Congress would never would meet its obligations. Hoping to intimidate Congress into meeting those requirements, the nationalists in Philadelphia attempted to stoke the army's unrest. The advisers represented in the Be Washington experience are all based on real-life historical figures from the first president's cabinet, military leaders of the Revolutionary War, and more. Learn more about your advisers in the Newburgh Conspiracy scenario.